This is a great project for anytime you don’t want to have a large “crafting footprint”. 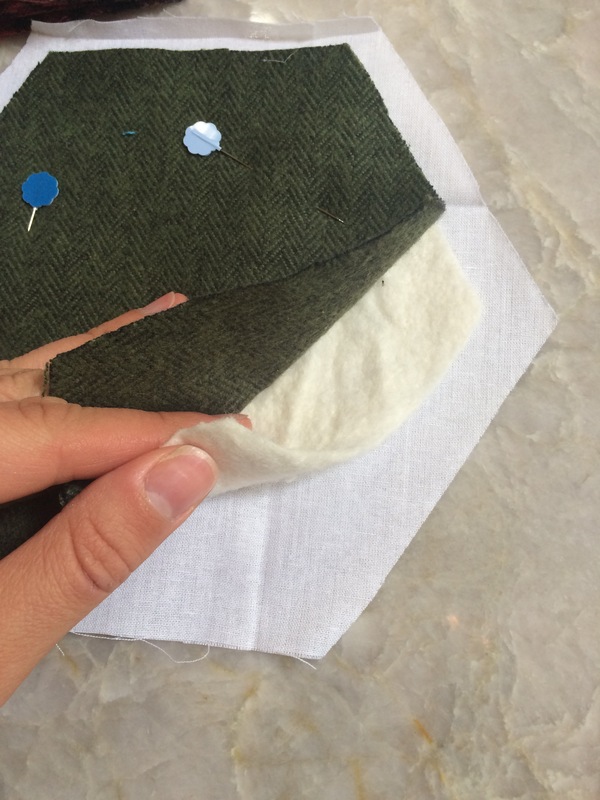 I began this project because I wanted something I could work on while away from home that didn’t require a sewing machine and used the fewest supplies possible. 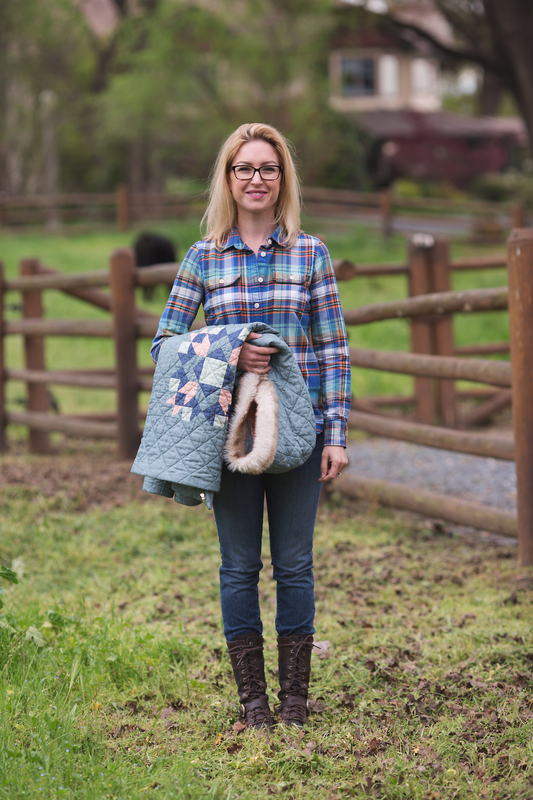 What I love about this quilt is that I can fit everything I need in a small bag that fits in my lap while riding in a car, or kicking back on the sofa. We often travel with extended family and LOTS of kids so spreading out a bunch of supplies when we reach our destination really isn’t an option. There are just too many tiny, grabby little hands to have sewing supplies lying around where they might get snatched and someone could get hurt. So this is my solution. It is akin to EPP with one major bonus. Because you add to the quilt as you go there is no basting or quilting after the top is complete. Every single Hexie is essentially a tiny 6″ quilt and you just keep building until you have achieved the size you want. 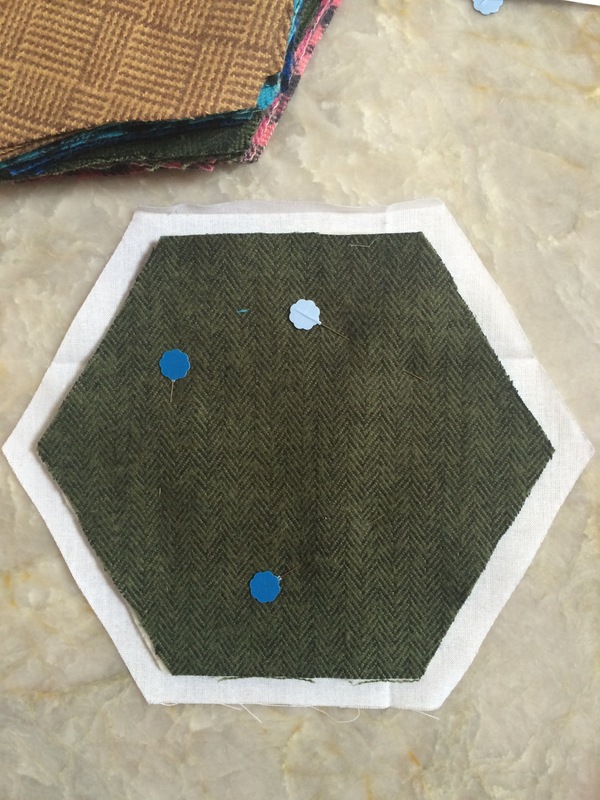 Additionally, you can prep and cut all your hexies before you leave home to make it easier and make your footprint even smaller. Doing so eliminates the need for fabric shears. 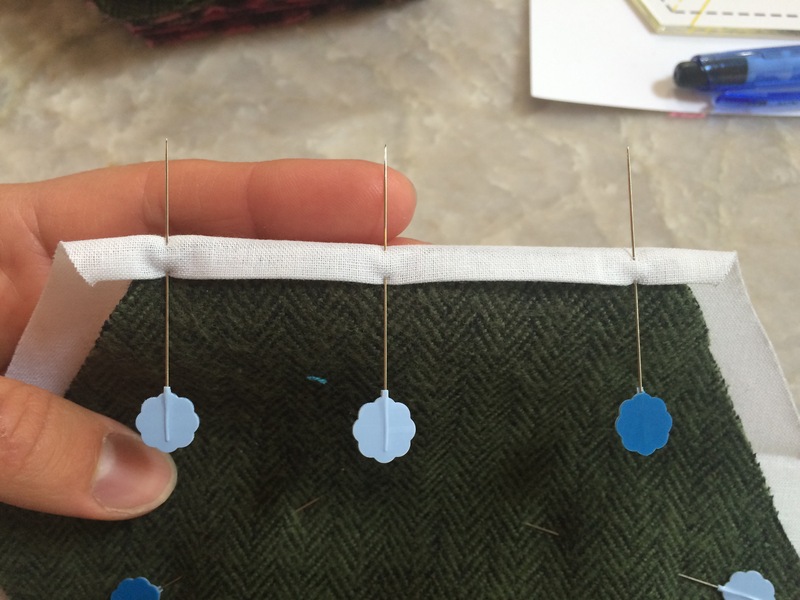 If you precut your fabric all you will need for cutting is a pair of snips for clipping threads. One 5.5″ Hexie template, and one 6.75″ Hexie template (if not precutting fabric) Note: this measurement has been updated since the photo above was taken. 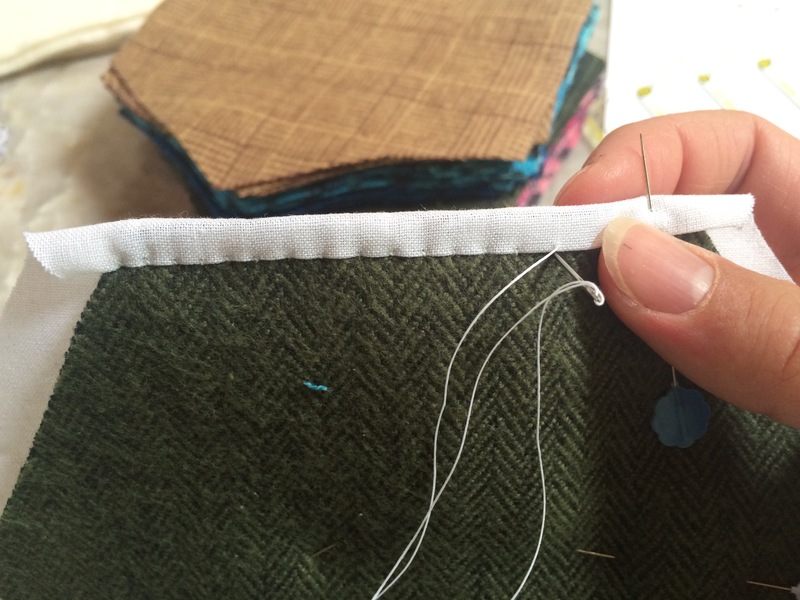 I find the extra 1/4″ better accounts for the turn of the fabric and thickness of the batting when turning the binding. 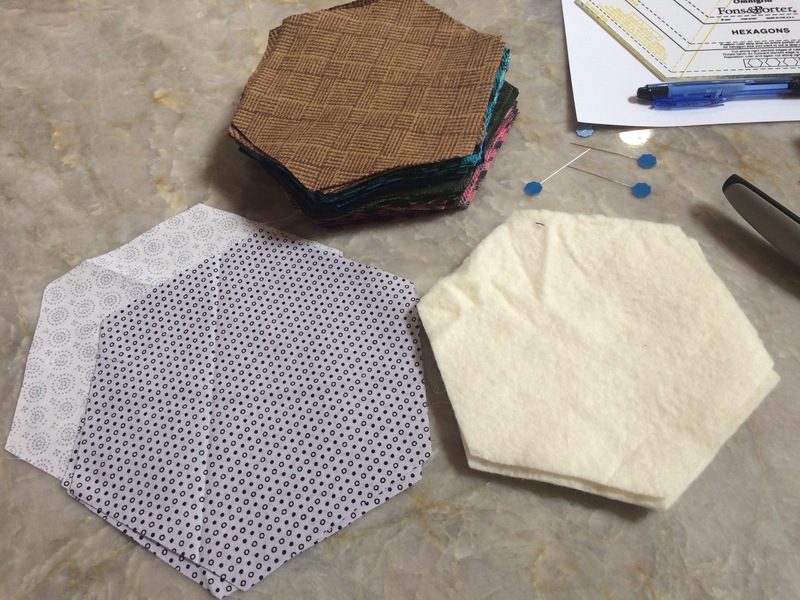 Using the templates you made out of cardstock, trace and cut out a stack of 5.5″ hexies out of quilt top fabric. 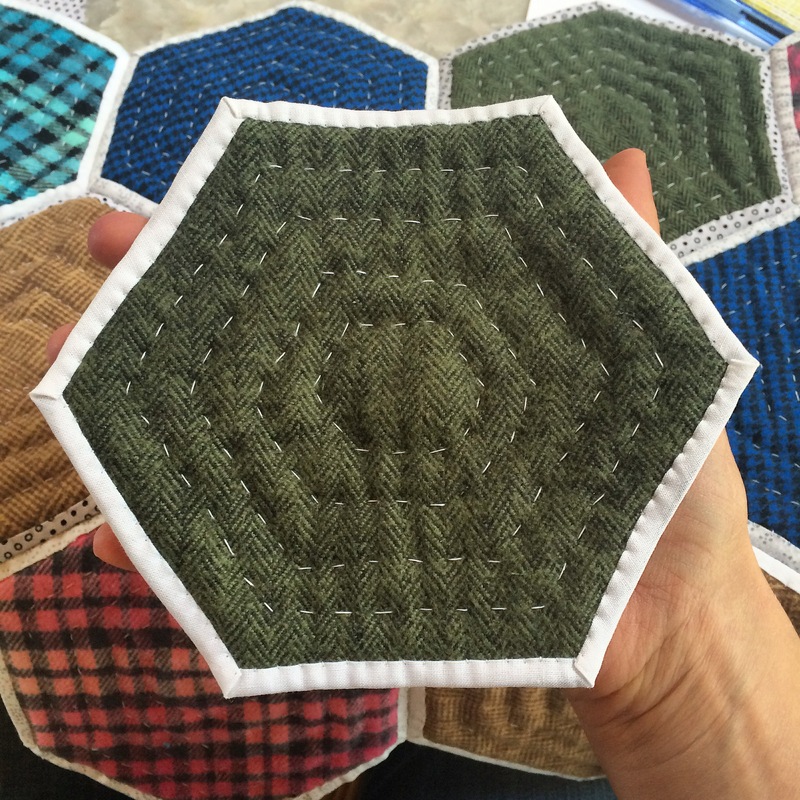 Trace and cut out a stack of 5.5″ hexies out of batting. 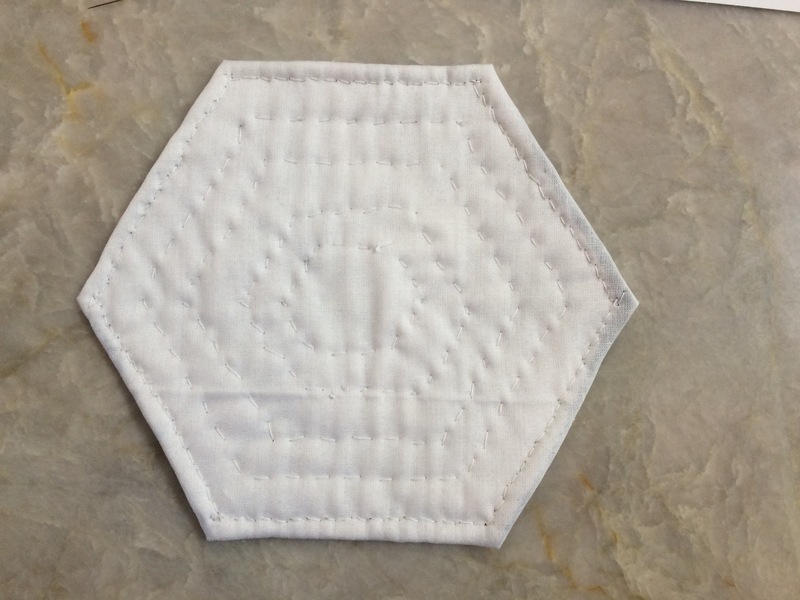 Trace and cut out a stack of 6.5″ hexies out of backing fabric. Make a quilt sandwich with the backing, batting, and top fabric and secure with a couple of quilting pins. Starting along the side that goes either with or across the grain, turn backing and finger press at 1/4″. 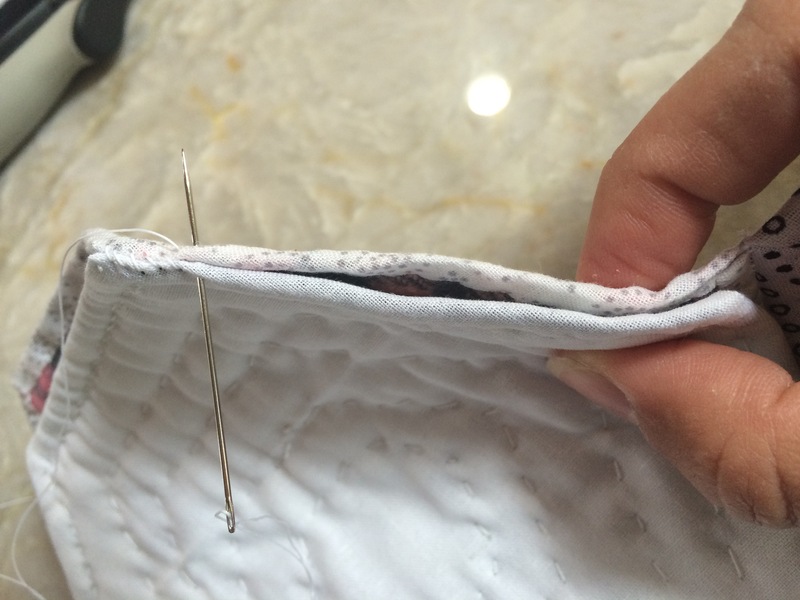 Then turn over another 1/4″ covering the raw edge of the top fabric and secure with pins. Begin stitching the turned edge down. Do this by going through all three layers to close the binding and quilt the layers at the same time. When you get to the next edge, turn as before and continue until you have stitched the entire perimeter of the Hexie and all raw edges are enclosed. 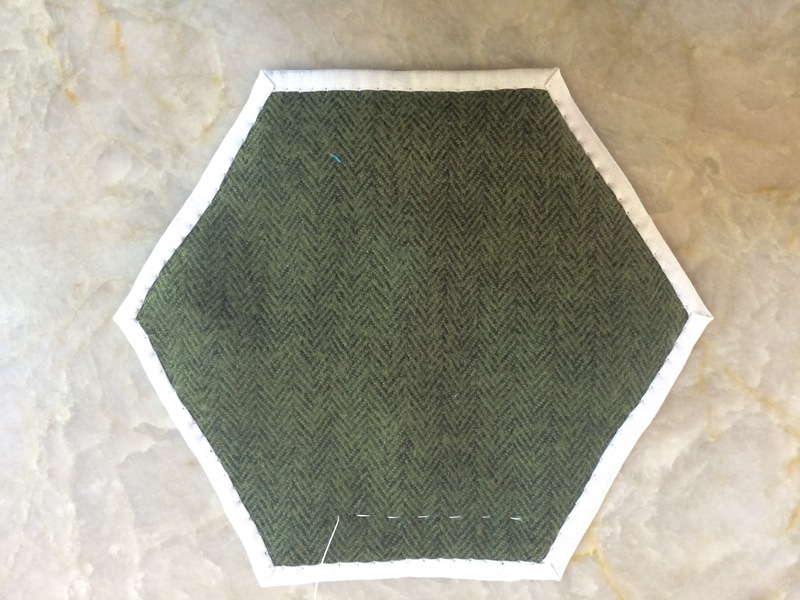 After you have enclosed the Hexie and have a miniature quilt, add additional quilting stitches in the pattern of your choice. I have chosen to follow the Hexie shape in descending sizes. Once you have a few of these mini Hexie quilts completed you can connect them together. Your quilt is finished when you decide that it’s big enough. My extended family has a vacation home in the mountains that we all share and use frequently. It seemed fitting to keep this project here at the house and just chip away at it whenever we are fortunate enough to sneak away for the weekend. Since there are so many people that use the house I have encouraged family members to leave scraps of fabric for me that have special meaning to them to incorporate into this quilt that we will all eventually share. This way there’s is a little piece of all of us stitched into it. Since I will only get to work on this project a few times a year I’m assuming it will take awhile to finish. I’m anxious to see how the scrappiness of the quilt changes as my fabric supplies change over the years. Perhaps my family will be able too look at it years down the line and the different fabrics will be like rings on a tree. 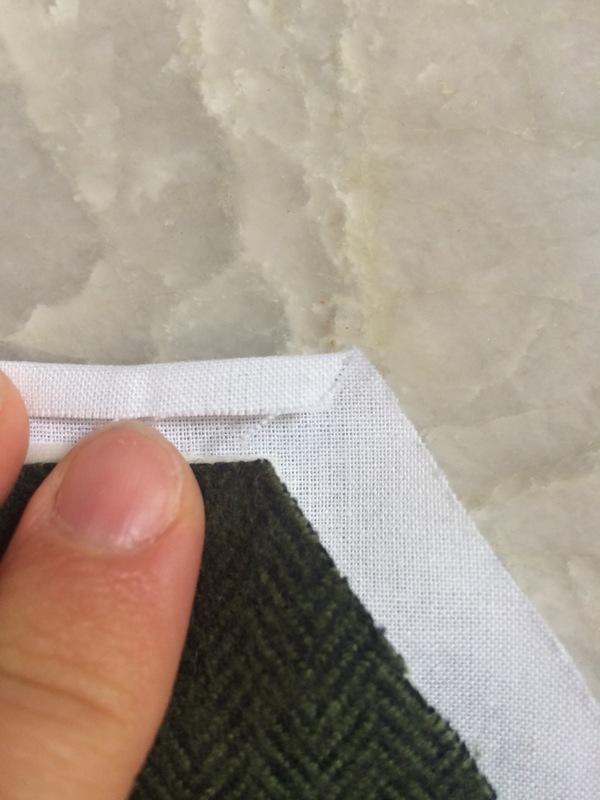 Certain fabrics will have memories of specific trips attached or perhaps specific people. Each family member will be able to share the coziness and the memories for generations to come. This is great! And I love the idea of having other people leave scraps that become a part of the project. Thanks Elizabeth! So did everyone else. I also love the idea that it can be used before its “finished”. Right now it’s a table runner. After that it will most likely be a baby quilt. Then a throw, and so on… I love it! Jennifer! I’m sitting here outside of Reedley to the east (Dinuba and Crawford), sewing, and listening to Pat Sloan on APQS podcast. And am thrilled to hear you and central valley and Fresno and Reedley and MQC!! Wow! I too am a quilter and also volunteer at the store! What a trip to hear it mentioned. Anyway. I will have Janet Lammelen and Marci from the store listen next Tuesday when I go in to help. And I just love your QAYG big hexie. 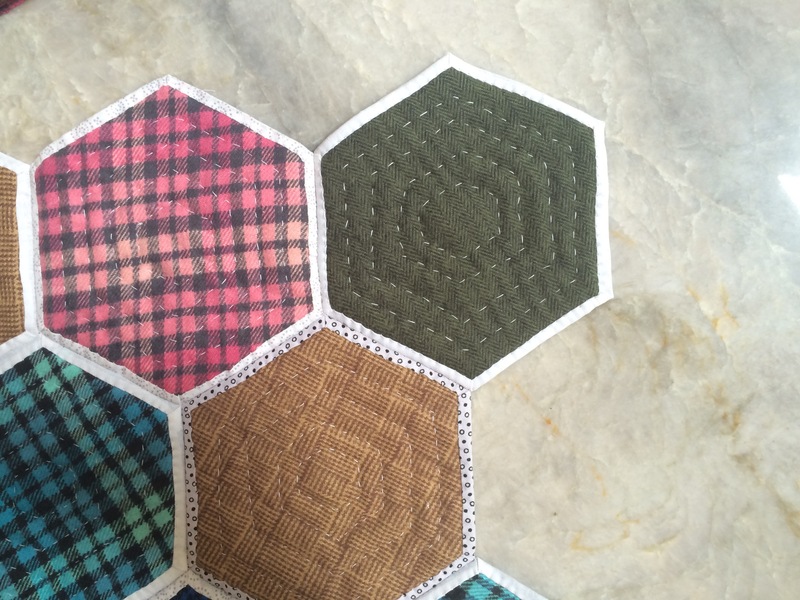 I happen to love handwork and qayg and have been sewing little hexies during tv time. But I’m putting those away and starting a big hexie quilt. Great! Thankyou. and love hearing ab out you. yea! Wow Annie! I’m so happy that you listened. 😀 It’s true! I took my very first quilt class there at the Mennonite Quilt Center in that upstairs room somewhere around 2003. It was the denim quilt and I bought many of the pairs of jeans to make it next door at Nearly New. 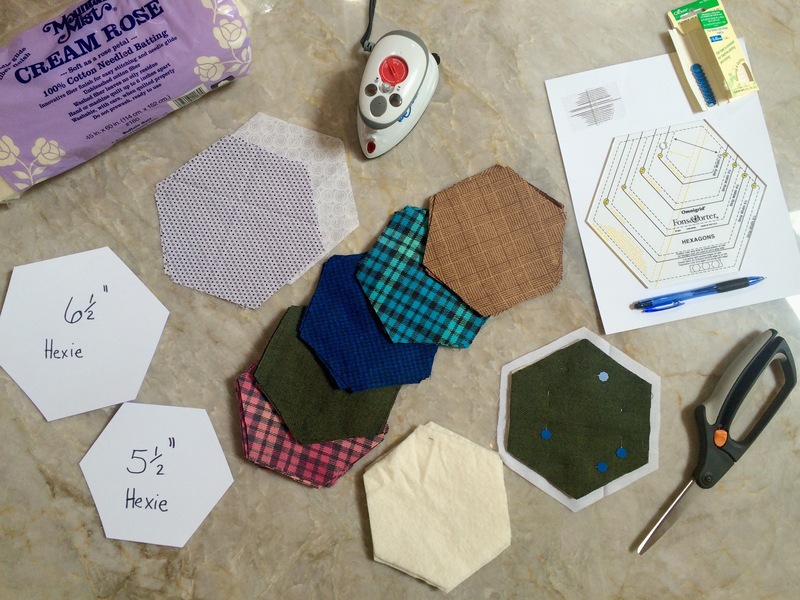 Thanks for reading the blog and good luck with your Hexie project! This is fantastic! 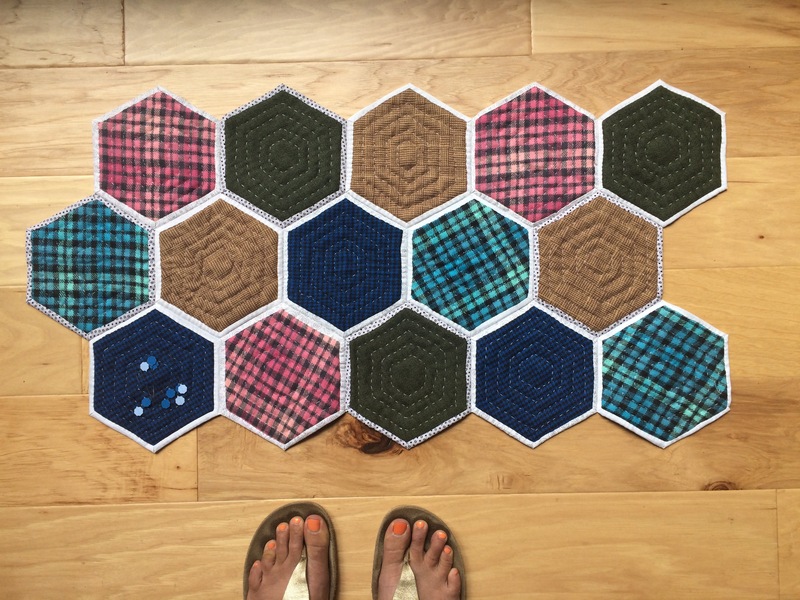 I don’t have a lot of room to quilt (and very little experience) but love EPP (or the idea of it) so I love this hexie quilt. Seems so much more plausible for someone like me. This is a great project for stitching while hanging out with he family on movie night or while traveling on road trips or any where you won’t be able to take a machine. My favorite travel project.